Hi This worked fine for me. 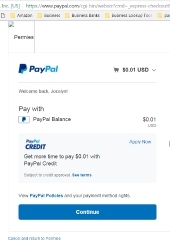 I clicked buy, it took me to paypal, then the video came up. Janette Rankin Peace Center Missoula, MT is hosting a 2nd annual all day event on Saturday June 11, 2016. It is a well structured open space platform where the only agenda is the platform itself. All who come can bring any idea foreward and have a potential round table discussion. Last year there were an average of 8 groups per hour for 4 to 5 hours and a wonderful outdoor reception afterward. We are expecting more this year. I need to find a new place to live in Missoula by June. Ideally a permie friendly location where I can be of general assistance daily and with permie projects. My email is gerowwl@yahoo.com. flushing diversion has been addressed. I am concerned with natural occurring ick from stagnation in an above ground cistern. the ones we have are typical green colored meant for above ground from a retail seller. Does anyone have thoughts on preventing ick developing in rainwater collection containers? Or neutralizing once there. I am working on a residential 1 acre with an in-ground swimming pool with adjacent hot tub and patio perimeter. All functions, are working and/or operating, which appears wasteful for a pool hardly used. There are a few buildings, gardens, and chickens so far, and the property receives sun all day all year. The owner may be open to repurpose with convincing alternatives. The easiest idea is rainwater storage, though it is always holding water. Aquaponics has been addressed, especially with core elements in place, but may be ambitious for now. I am also considering greenhouse options. I would love to hear some ideas. Thanks, those replies are what I had in mind yet trying to avoid. I have come up with alternatives. I have/am setting up rain barrels at various gutter locations on a property located to be used for their nearby distribution. I have an above ground 1000 gallon cistern that I would like to divert overflow from each during large rain events. This probably must incorporate the use of pumps. Any ideas on a pump that would turn on during overflow then shut off accordingly would be appreciated.